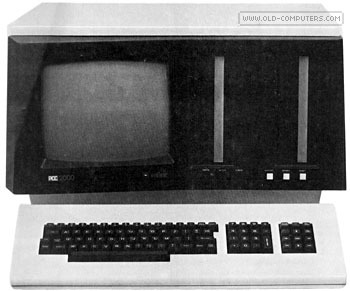 PCC 2000 is an obscure professional computer released in 1980. It was marketed by Ordisor in France, (a company belonging to the group Sofragem) but the machine was in fact imported from U.S.A. The PCC 2000 was designed there in 1978 by Pertec, the company which merged with MITS by the end of 1976. The only information source we have for the french version is an advert from may 1980. Looking at the picture, the PCC seems to be conceived as a monobloc machine, where the display and two 8" floppy disk drives are built-in the main case. The keyboard (AZERTY here) with its separated numeric and editing keypads is not detachable. As you can see we don't much about this system, help is largely welcomed. see more Ordisor PCC 2000 Ebay auctions !